When I was pregnant with my first baby, I started to look into the different things that you could use on your car windows to protect your child from the bright glare and heat of the sun. Initially we were given some second hand window socks (like a sleeve that goes on your window) and also one of the sun-screens with suckers on that you can pop onto any window. Never one to pass up a freebie, we gave both of these shade solutions a try, but had no luck with either. The problem with the window socks, were that whilst they were effective for controlling the glare, I found them too dark to look out of for blind spots when driving, and they were also a tad ugly. With the popup window screen, these were slightly better, but they loose their suction power fairly easily and I was forever having to stick them back up, which was frustrating. 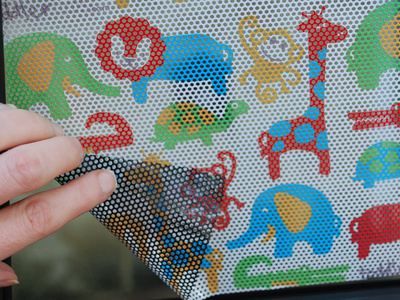 A great solution, I eventually chanced upon was Toddler Tints, a completely different window screening solution based upon the two way vision advertising you see on the windows of buses. How does Toddler Tints work? Toddler Tints stick directly to the inside of the car window. It's an easy process to adhere the Toddler Tint to the window, just cut to size and then soap down the car window (using a sponge) and smooth the screen to the window using a wet sponge if necessary. I found using the wet sponge helped to get out the air bubbles. Further alterations for size can be done after you've got the main body of the Toddler Tint stuck to the window. You can get the perfect fit for your window very easily. After 24 hours, your window is ready to go and you can wind down the window without any damage to the Toddler Tint. For full application (or removal) instructions, check out the videos here. The Toddler Tint is tested to Australian sun safety standards and offer UPV 15 protection. They will cut the sun's heat by up to 60% which is important if you've got small infants travelling in your vehicle. I love Toddler Tints and find that they provide a great sun screening solution for my car that doesn't inhibit my driving visibility, which is important as I'm not the greatest driver at the best of times. 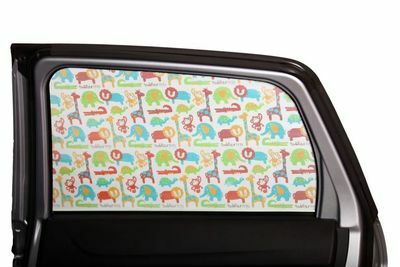 I love the playful zoo print design which is attractive to have on my car and doesn't limit my kids visibility either. From the outside, you can't really see that the Toddler Tint either, so whilst my son enjoys seeing all the animals on the window, the outside world is none the wiser. We've had our Toddler Tints on our car for 3 years now, and there is no fading or wear and tear, and not even the corners have come undone. Once applied, these are a hassle free sunshade option that keeps your kids protected without bulky or ugly screening options. At just under $40 they are not the cheapest option, but based on their usability and durability, it's a good investment. To find out more about Toddler Tints you can visit their website here.